How to Approve Fabric Color From the Buyer? Fabric color approval is one of the important tasks garments merchandising. It should be done by the garment merchandiser after receiving a garment export order. To approve fabric color from the buyer, some procedures have to follow. Those procedures have discussed in this article. Lab dip sent to the buyer for color approval. At the beginning of a garment export order, garment buyers send a garment specification sheet to the garment merchandiser which contains all the necessary information about the order. Fabric color also mentioned in that specification sheet as pantone number or pantone code. It is the second stage for the fabric color approval procedure. After receiving garments specification sheet, the first duty of a garment merchandiser is to send the buyer’s selected color (pantone code) to the fabric dyeing and washing factory for completing lab dip. 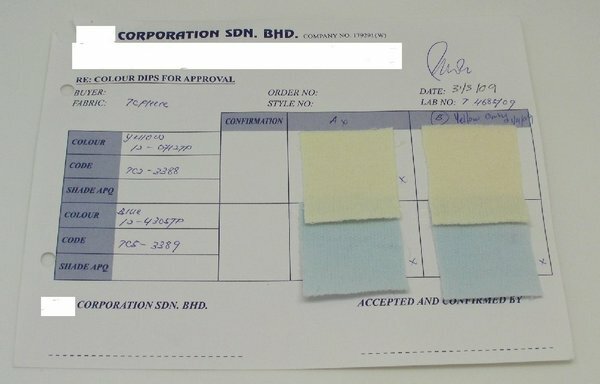 After completing lab dip, fabric dyeing and washing factory submit the required color lab dip to the garment merchandiser by grading A, B, C. it should be noted here that, three copy lab dip submission forms have to ready for each pantone number. One for the factory, one for the garment merchandiser and another one is for the buyer. It’s the final stage for the fabric color approval procedure. 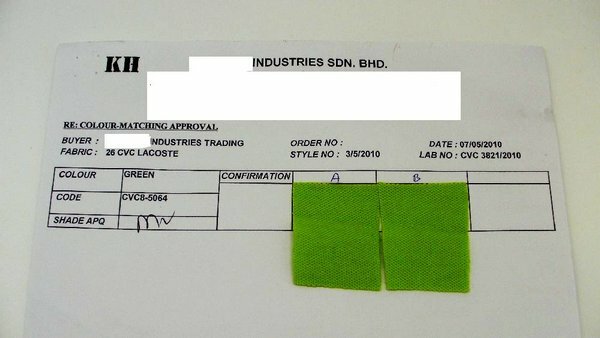 Here, garment merchandiser sends all the required color lab dip to the buyer for approval. After checking all the lab dips, Garment buyers confirm the definite grade of color for his fabric and inform to the garment merchandiser. In this way, fabric color is approved by the buyer for the garments production. How to grant fabric color from the buyer? How to approve lab dip from the buyer? Fabric color approval method followed in readymade garments industry. Show a lab dip approval method. Mention all the procedures for lap dip approval. Mention fabric color approval procedure.